George Bernard Shaw: The playwright's answers to a 1931 questionnaire about God. 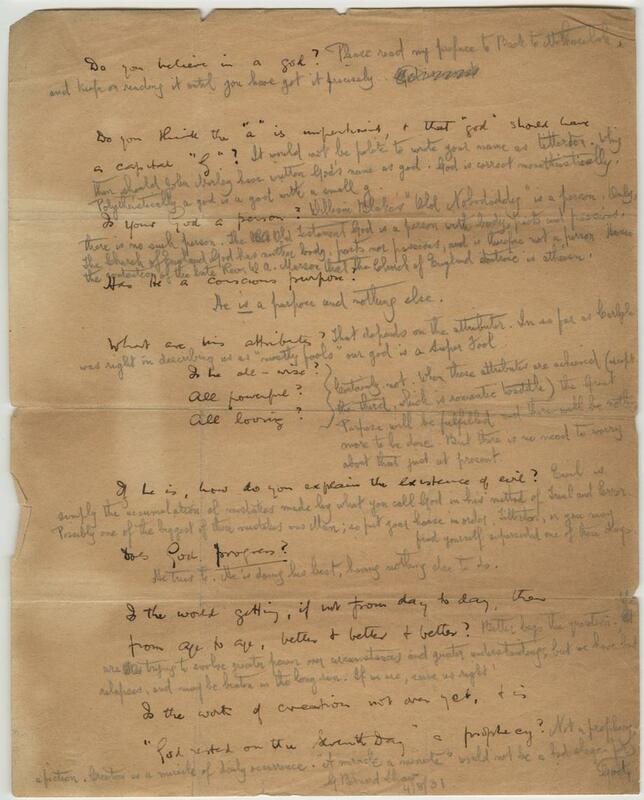 In his answers to this 1931 questionnaire sent to him by a journalist, 75-year-old playwright, author, and critic George Bernard Shaw recorded his current thoughts on a serious matter: the nature of the divine. Shaw, a man with many demands upon his time, redirected some questions sharply. (The maddeningly open-ended query “Do you believe in a god?” met with a request that the journalist “read my preface to Back to Methuselah, and keep on reading it until you have got it precisely.”) But, in general, he gave humorous and expansive answers to the questions. Shaw believed in the idea of “creative evolution,” in which man and God both (as he wrote here) worked by trial and error to “evolve greater power over circumstances.” This ongoing process was akin to scientific investigation, and, ideally, married faith and reason. Though some modernist [writers] may have been hostile to aspects of Christian culture and theology, we have still not fully appreciated the fact that they were almost never indifferent. As this document shows, Shaw, who early on self-identified as an atheist (and always questioned organized religion), was in his later years putting much thought into the possible existence of the divine. A transcript follows the image. Copyright © The Estate of Bernard Shaw. By permission of the Society of Authors, on behalf of the Estate. Please read my preface to Back to Methuselah, and keep on reading it until you have got it precisely. Do you think the “a” is impertinent, and that “god” should have a capital “G”? It would not be polite to write your name as tillerton. Why then should John Marley have written God’s name as god. God is correct monotheistically. Polytheistically a god is a god with a small g.
Is your God a person? William Blake’s “Old Nobodaddy” is a person. Only, there is no such person. The Old Testament God is a person with body parts and passions. The Church of England God has neither body, parts nor passions, and is therefore not a person. Hence the contention of the late Rev. W.A. Marson that the Church of England doctrine is atheism! Has He a conscious purpose? He is a purpose and nothing else. That depends on the attributor. In so far as Carlyle was right in describing us as “mostly fools” our god is a Super Fool. Certainly not. When these attributes are achieved (except the third, which is romantic twaddle) the Great Purpose will be fulfilled and there will be nothing more to be done. But there is no need to worry about that just at present. If he is, how do you explain the existence of evil? Evil is simply the accumulation of mistakes made by what you call God in his method of Trial and Error. Probably one of the biggest of those mistakes was Man; so put your house in order, Tillerton, or you may find yourself superseded one of these days. He tries to. He’s doing his best, having nothing else to do. Is the world getting, if not from day to day, then from age to age, better + better + better? Better begs the question. We are trying to evolve greater power over circumstances and greater understanding, but we have bad reflexes, and may be beaten in the long run. If we are, serve us right! Is the work of creation not over yet, and is “God rested on the Seventh Day” a prophecy? Not a prophecy, a fiction. Creation is a miracle of daily recurrence. “A miracle a minute” would not be a bad slogan for God.